Donkeylicious: How Does Romney Win? I've been perplexed by Mitt Romney's supposed GOP frontrunner status for a while now. Didn't we see this scenario play out in GOP Senate primaries all across the nation last year? Well-funded mainstream Republican runs against Tea Party extremist. Tea Party extremist wins. Poor candidates like Sharron Angle and Christine O'Donnell as well as mediocre candidate Ken Buck won their primaries in extremist roles before losing general elections. And then there's the strange case of Alaska, where the Tea Party won the primary and got Liebermanned by the defeated Murkowski in the general election. The Tea Party did defeat a few mainstream Republicans and win Senate seats too -- that's what we saw in Utah, Kentucky, and Florida. But the number of cases where the mainstream Republican faces any kind of contested primary and triumphs is pretty small. True believers win Republican primaries, not technocratic chameleons. 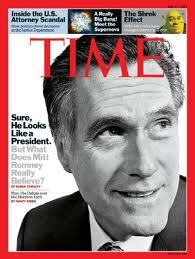 Which is unfortunate, as I think Romney is probably the best potential president in the GOP field. I'd rather have a unprincipled poll-driven Republican than a principled one, since Republican principles are terrible. But barring some kind of unlikely scenario where the extremists can't unite effectively around a single candidate, I don't think all his money can buy him the nomination. The problem is that the extremists are all crazy as bedbugs, and (unlike in the Senate primaries last year) there's likely to be a goodly number of them to choose from, without a clear favorite. Read Nate Silver's piece about how The Donald has rocketed up in the GOP polls. The wingnuts and crazies are grasping at straws here. The lack of what they would regard as decent choices is likely to both divide and depress True Believer turnout. (If they unite behind anyone, my guess is that it'll be Bachmann.) Meanwhile, establishment conservative support is likely to coalesce behind a single candidate pretty early. And unless Pawlenty or Mitch Daniels starts setting the hustings on fire, Mittens is likely to be that guy. So he'll place a respectable third in Iowa, win NH going away, probably finish second or third in SC but win by pluralities in FL and NV before racking up a goodly number of plurality wins on Super Tuesday. Not saying that's what WILL happen, but that's a plausible set of events that would lead to a Mittens nomination.